Apollo 440 are an embodiment of musical open-mindedness. A broad range of creative input from affiliate members is equally immanent to their approach of being a band, as is the wide diversity of musical output. The group's directive core-players are Noko, Howard Gray and Trevor Gray. The Liverpoodleans formed the band together with James E. Gardner in 1990 to explore the meaning of life. A few years later, following a tradition of ground breaking bands from Liverpool, they moved on to the world's capital of pop music, London. Already having prepared the ground for their sublimal stealth sonic sound synthesis, James went to the other side of the world, from where he can still be heard on the records through Theta Wave Enhancement. Apart from various frequent visitors, a long time regular in their executive line-up is Cliff Hewitt, heavenly drummer from hell. Through work on their second album and the following touring, an extended setup of the band established. 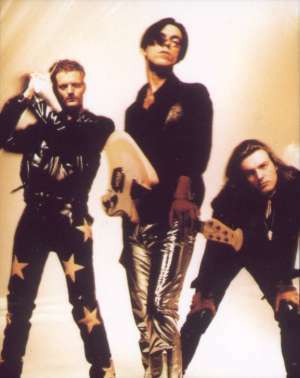 This consists of Noko (guitar), Howard (engineering/mixing), Trevor (keyboards) and Cliff (drums) teamed up with the man of million names Mary Mary (vocals), Harry K. (scratches, samples, shouts), Paul Kodish (drums) and Rej Ap Gwynedd (bass), whom due to unavailability got replaced by Kenny Cougar during recordings of their third album.